When you first come as an activist to this country it can be hard to find the women among the very active, very welcoming Palestinian activist men. As you come more often, and as you dig a little, women appear, activist and not. 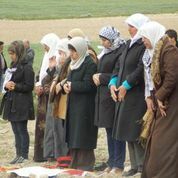 Palestinian women fight on two fronts, we discover: ‘we take the time to resist the occupation but we forget our women’s rights’ says our friend Myassar Atyani. Last week, after a superb communal breakfast with the women of the Nablus General Union of Palestine Women, we settled down to find out about women’s suffering in the West Bank, and about their fight for their rights. These protective measures are still very far from a reality on the ground here (as indeed they are far from reality globally). Women here fight to improve their rights in marriage, divorce, inheritance and custody of children, and they find that women are coming forward now to demand those rights in the courts. There is a culture change, slow in coming, but coming. The greatest barrier remains the weight of traditional culture: ‘even left wing and communist men are Middle Eastern in their hearts, although they say they support women’s rights’, says Myassar. And they have to fight engrained attitudes among women too. The second barrier is that civil law here is de facto Islamic law, which has placed itself above international law where the two come into conflict. These are early steps in my awareness and understanding of how women fight and live here. Next steps are to try to make international activism reflect this fight. * CEDAW, the UN Convention on the Elimination of Discrimination against Women, and Resolution 1325, which places women at the heart of conflict resolution processes and urges special measures to protect women from gender based violence in conflict situations.